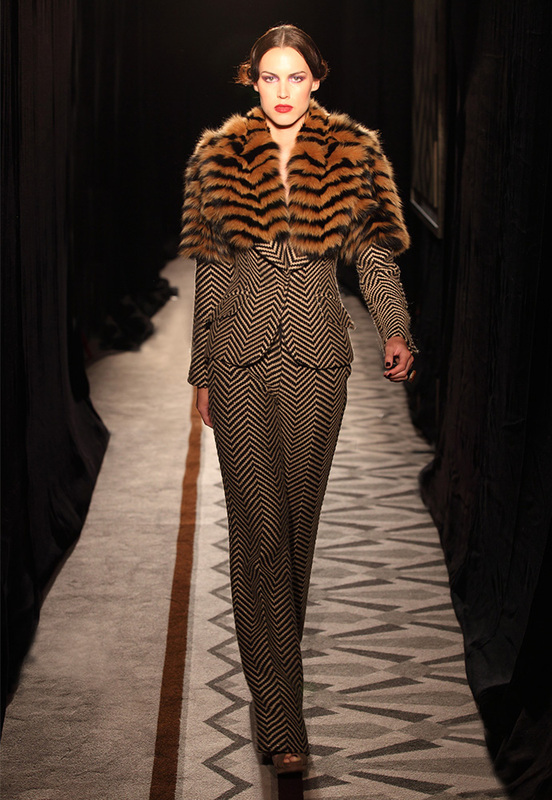 The Autumn/Winter 2012 Collection is loosely inspired by the 1978 film ‘Eyes of Laura Mars’. Nicholas focused on the dashing cloaked glamour of Faye Dunaway and elements such as the muted, controlled colour palette in the film. This developed into a fascination with the moody and luxurious New York ‘lounge’ environments, typified by low-lit loft apartments and Abstract Expressionist artist Franz Klein. In this collection, Nicholas explores the relationship between1940s and 1970s style, drawing inspiration from flamboyant 1970s Savile Row tailors such as Tommy Nutter. Nicholas celebrates the concept of masculine tailoring worn by women, as well as intricate techniques of 1940s couturiers such as Madame Grès. Further inspiration comes from the slightly prim, Edwardian style that surfaced during the 1970s, embodied by Princess Anne at the time of her wedding. Nicholas has taken all of these references and created an entirely modern and luxurious collection. 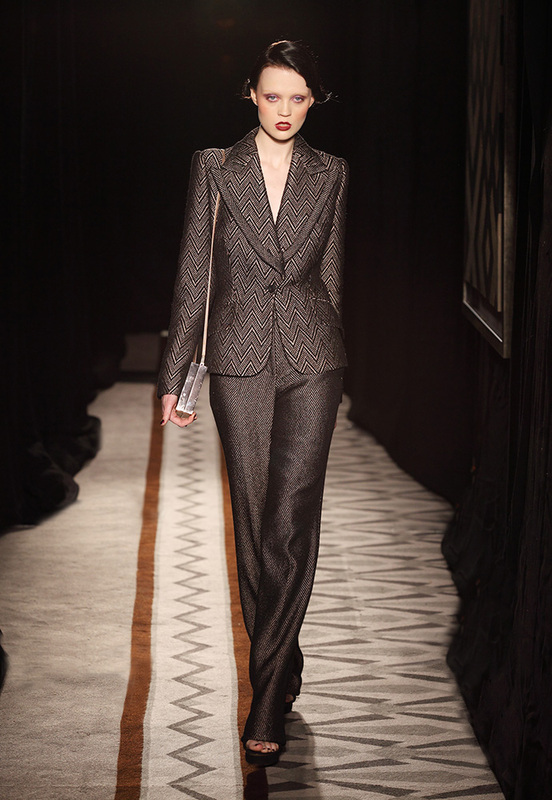 Sensuous materials, glamorous gowns and chic tailoring create a sultry, sophisticated mood. As in his previous collections, Nicholas uses luxurious, bespoke and unconventional materials and techniques. This is illustrated through the use of shaved mink and fox fur, smocked cashmere and flounced suede. Nicholas again champions the best of British craftsmanship working with artisans and artists around the British Isles to produce the collection’s hand-made lace and hand-woven tweeds. Ongoing collaboration with Nicholas Kirkwood yields a sumptuous selection of footwear in mink and suede. Collaboration with master perfumer Roja Dove brings a bespoke fragrance created to compliment the collection. The fragrance Roja has created is a Chypré: fresh, sweet, leathery and sensual. Nicholas Oakwell launched his career as a milliner and has a reputation for his exquisite craftsmanship and his eye for elegant design. This is his second couture collection.